Our arteries deliver oxygenated blood from the heart to important organs. As we age, these arteries are affected by atherosclerosis. This is a hardening of the arteries that results in plaque formation. In the legs, this plaque can narrow or occlude the lumen of the artery and thereby result in reduced blood flow. The body will try to compensate for the reduction of blood flow by forming collateral pathways, bypassing the plaque. This may or may not be enough for some people. 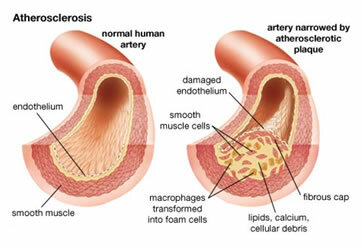 Atherosclerosis not only affects the arteries in the legs. It occurs in all arteries including those to the heart and brain. As part of our approach to peripheral vascular disease, we manage all the risk factors to reduce your overall cardiovascular risk (reduce heart attack and stroke) improving survival, as well as managing your legs. By addressing and optimising these risk factors we can reduce your overall cardiovascular risk and improve survival. Patients may present with difficulty walking, pain at rest, ulcers or gangrene. Many patients will not have any symptoms and be completely unaware that they have PVD. The degree of symptoms relates to the site and extent of disease, the body’s ability to compensate with collaterals (small arteries that open up to “bypass” blockages in our main arteries) and your level of daily activity. When a person walks, the muscles in the legs increase their demand for oxygen and nutrients. If arteries are unable to keep up with demand due to narrowings and/or blockages, pain results in the affected muscles. This is called claudication pain. The situation becomes more urgent when, even with the patient resting, there is pain. This typically occurs during the night when the feet are resting level in bed. The patient often gets relief by placing the foot over the side of the bed or keeping it dependant. This is called rest pain. In this situation, the leg is threatened because there is not enough blood to maintain the leg even at rest. The situation worsens when there are ulcers and/or gangrene as this is a result of tissue dying from the lack of blood to that area. The majority of patients who present with difficulty walking (claudication) have a benign condition that will be an inconvenience. Only a small proportion of these people will actually progress to risk of limb loss. Patients with pain at rest, ulcers and/or gangrene, have immediate threat to their leg and require urgent assessment and revascularisation if possible. Our initial investigation is with non-invasive imaging. 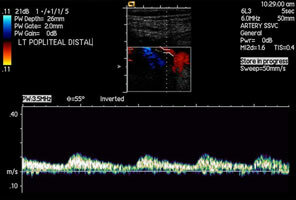 We use ankle-brachial pressure indices (ABPI) and duplex ultrasound to quantify and establish the site and extent of the disease. If further information is required, a CT-Angiogram or MR-Angiogram may be performed. 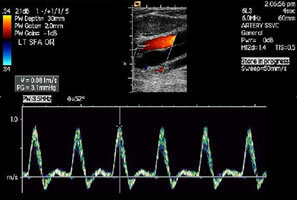 The definitive test to image the arterial tree is a formal angiogram. This test is performed under local anaesthetic +/- sedation and involves injection of contrast into the arteries providing a roadmap of the site and extent of disease. These days, an angiogram will often be performed at the same time as an intervention (eg balloon angioplasty or stent insertion) to treat the problem. 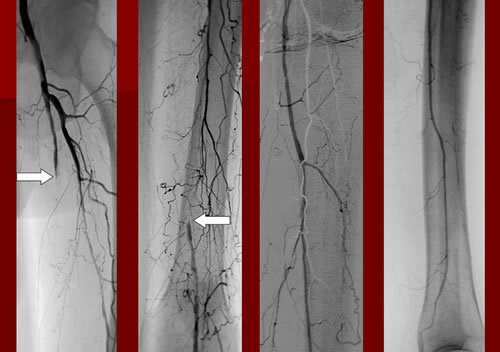 Figure 5: Formal angiogram images showing a “road map” of the arteries in the leg from the hip (left) to the ankle (right). 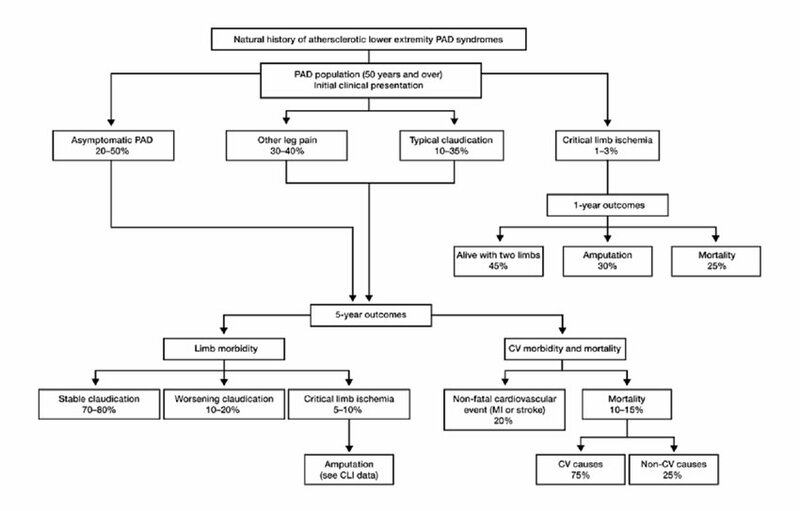 The management of patients with peripheral vascular disease needs to be directed at their overall atherosclerotic risk factors as well as consideration of revascularisation. The medical optimisation of risk factors is important. Advice and help in regards to ceasing smoking, good blood pressure control, good glucose (“sugar”) control for diabetics and cholesterol lowering measures is essential. All patients should be commenced on a blood thinning agent (anti-platelet agent) such as low dose aspirin, unless contra-indicated. All patients should be considered for commencing on a “statin” agent to lower cholesterol regardless of their cholesterol levels unless contraindications exist. For many people, claudication can be managed conservatively with the above “medical” management, exercise (which can improve the walking distance for many people), learning to live and adapt to any limitation in activity (eg allowing more time to walk from one place to another with short “rests” as needed) and reassurance of the generally benign nature and natural history of this problem. 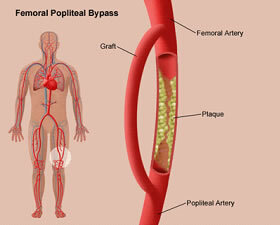 Many people are walking around with complete blockages in the arteries in their legs without even knowing it!! For claudication, the need for intervention is really determined by the level of inconvenience for the patient. If claudication is becoming disabling, there is rest pain or ulcers and/or gangrene, revascularisation is considered. Revascularisation may involve open surgery (bypass, endarterectomy) endovascular techniques (minimally invasive – balloon angioplasty, stents) or a combination of both. There are many considerations in order to provide the best revascularisation option for you. Most patients today are thankfully able to be offered some form of minimally invasive treatment for their PVD. Early assessment is recommended as treatment can become harder and more risky if the situation is allowed to progress unmonitored for too long. In some cases, treatment in the form of revascularisation is just not possible and in dire circumstances amputation becomes the only option. With modern endovascular and surgical techniques, this is thankfully becoming a much less common (and potentially avoidable) outcome. If needed however, amputation can of course lead to another form of reconstruction – with modern artificial limbs (prostheses). Further information on the diagnosis and treatment options for PVD is available at the time of consultation with one of our specialist vascular surgeons.